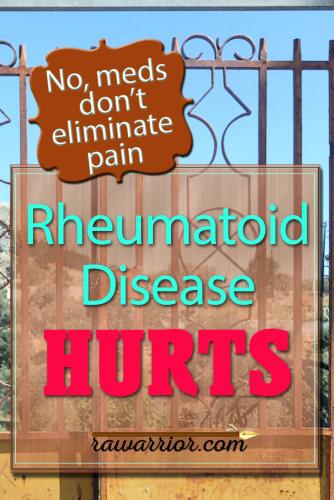 This is Part 3 of a series on Rheumatoid Disease / Rheumatoid Arthritis pain. In Part 1 we looked at the role of pain in the disease. Part 2 examines a popular study on Remaining Pain and poses 12 reasons that current explanations for Remaining Pain are wrong. In Part 3, we’ll see that the idea of Remaining Pain originates with a misunderstanding of Rheumatoid Disease / Rheumatoid Arthritis pain. Who has remaining Rheumatoid Arthritis pain? In all 58% reported remaining pain. Who were they? “Response” means improvement in symptoms in the EULAR rating system. The first thing to notice is the low response rate. DMARD and biologic response rates tend to be lower than advertised. Second, did you notice that, even if PRD had little or no response to a medicine, they could have “remaining pain”? 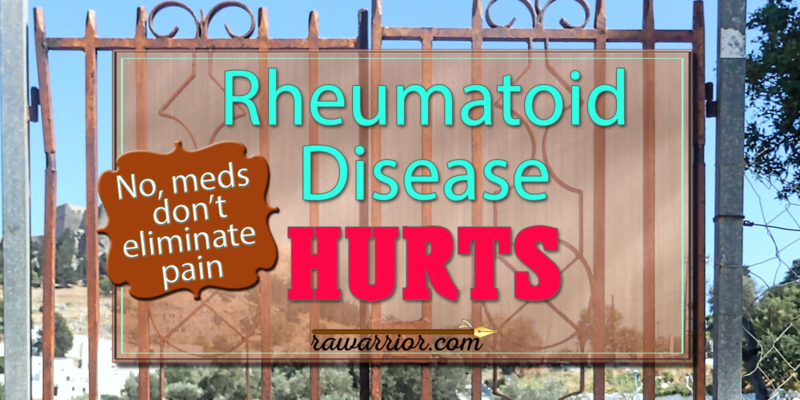 Is that actually remaining pain – or just remaining rheumatoid? If the medicine didn’t treat their swelling, stiffness, or inflammation, wouldn’t you expect them to still have pain also? That’s not remaining pain, but remaining rheumatoid disease. Calling rheumatoid arthritis pain “remaining pain” considers the DMARD as a cure. It’s like I put a coat of white paint on a blue wall and I ran out of paint. Some wall spots were remaining blue. I should not wonder why. They were not painted. Just like a person with RD was not cured. It’s also possible that some parts of the wall were painted too thin. These parts look light blue because they need more paint. These are like the PRD who need another medication to treat the disease and its symptoms. Adding the 35% to the 23% (moderate or no response to methotrexate) equals 58% of PRD with insufficient response. That’s the same percentage that reported remaining pain. They are not all exactly the same people because some from the good response group had remaining pain. But 58% with remaining pain should not surprise anyone. A majority has been inadequately treated. And the same majority still has pain. There is no surprise because no one was cured. 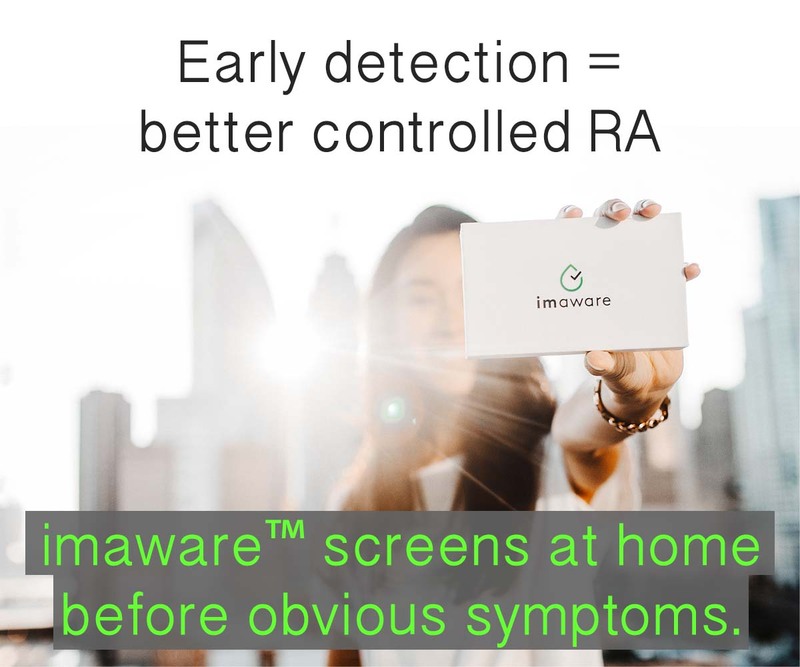 Symptoms remain, even in those with a “good response.” And because RA / RD is a painful disease, pain is one symptom that remains. Rheumatoid disease / rheumatoid arthritis pain does not occur in isolation as we’ve discussed before. PRD know it’s never “just pain” when they hurt. “Clinical” disease activity is defined by gross swelling that a doctor can see from across a room and high CRP or ESR blood tests. This is the problem. The remaining pain study says: “Here, we aimed to isolate the remaining condition of pain in spite of a clinically well-defined good effect of the treatment.” They define a “good effect of the treatment” without regard to a patient’s opinion. Despite any level of pain. And without ever considering the rest of the disease, beyond the obviously swollen joints. “Remaining pain” implies that the rest of disease activity has been addressed, and only pain remains. The study authors speculated that their patients had not been sick long enough to blame “damage” for their pain. I would assert then that they have not been sick long enough to learn “maladaptive coping” either. 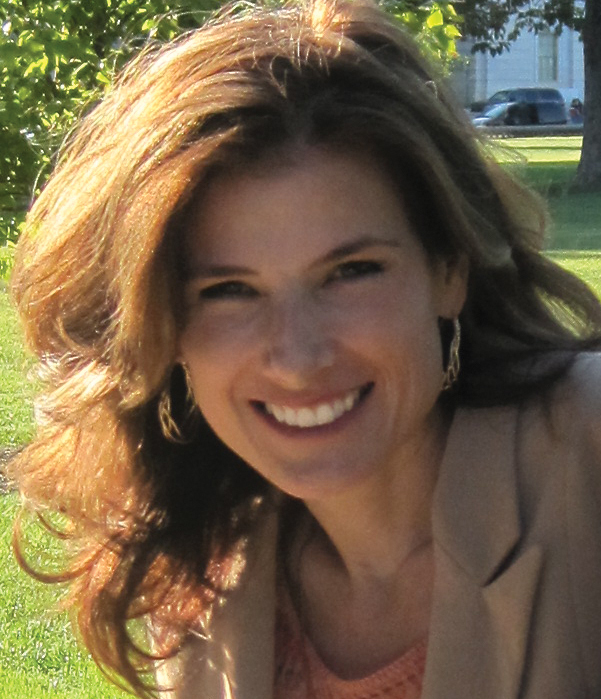 Research confirms patients’ experiences with disease activity and pain. CRP does not correlate well with patient’s outcomes, but patient-reported outcome measures do. Rheumatoid disease should be treated seriously to provide the best care possible and hopefully reduce the mortality rate of RD. No aspect of RD / RA should be assumed to due to maladaptive coping. Use expert MSUS to detect the presence of inflammation, not just ESR / CRP. Those tests may miss disease activity with many patients. Trust patients; they know the totality of their symptoms, including the ones you are not measuring or tracking. Ask them where it hurts and what they can’t do. Recognize the shortcomings of current tests based on the HAQ. Start by reading RPF’s ACR poster on the HAQ. (2) Click here to enlarge image. I ask detailed questions to pick apart claims of some researchers that millions of people with rheumatoid disease (PRD) actually have low pain thresholds. “Painful as it was to read, I examined the sixty-six footnotes looking for an answer. Many of the articles had footnotes of their own, so it was an infuriating couple of weeks…” Click to keep reading Does Rheumatoid Arthritis Pain Really Hurt That Much? Winter Solstice Lunar Eclipse: Was the Moon Really Red? The RA doctor that I see seems to think I am a hypochondriac about pain. I had two over 10 pound babies naturally and no screaming. I walked on a knee that was bone on bone for over 10 years. My orthopedic surgeon said he’s never had a patient with such a high pain level. Even though I’m on biologic and DRMDs, I still have swelling and pain. What’s getting bad are the rashes I’m getting. Since my labs are just under the high end of “normal”, the doc thinks I should be fine. He thinks the swelling is from carpal tunnel, but I tested negative for carpal tunnel. So if the disease is under control, why are my hands numb, swollen and red? Why does it feel like my feet are broken? Could pain be causing my blood pressure to go high? Seriously, what needs to happen to get this disease under control? No one can understand the pain of RD unless they are living with it. I get so sick and tired of hearing my doctor say “um, but your hands look good, no swelling”. Swelling or no swelling, I still hurt. And as far as my pain, I can handle pain, I have no choice because I have it every day of my life. I ended up in the ER due to stomach pain, pain that I let go for several weeks wondering if it was RA or something else. I was suffering from severe Diverticulitis that perforated and ended up having an ileostomy surgery. I was in the hospital eleven days. I had to go back in the hospital for another week to do the reversal surgery. I think us RA’ers tolerate more pain than any healthy person could ever imagine. And that’s just our physical pain, let’s not forget all the horrible side effects from all our medications. Every day is a challenge for each and every one of us. It’s so unfortunate that our disease is invisible because I don’t think we will ever get the understanding or respect that we all deserve. Excellent article 🙂 I really love the wall paint analogy; it is a great illustration of the issues we have with the treatments developed so far. The problem really is that we don’t understand the disease and keep making stabs at it. Like we are trying to paint the wall blue with a blind fold on and then wondering why we missed so many spots. The pain not treated is not “remaining” like the extrarticular symptoms of the disease are not comorbidities, rather they are just pieces of the disease. I think after working as an rn for 40 yrs I learned very little about my ra pts and their families. Now that I am in an acute flare up all those little ones through the years meant nothing. My family and I are in need of lots of info. Michelle Wiley on Rheumatoid Arthritis Support GroupsI'm in lubbock. 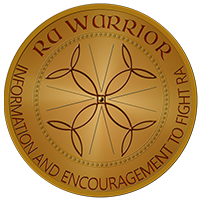 Just got diagnosed with ra in February. Havent been anle to find a group here.